I know I’ve mentioned this a couple of times, but I’m a mom. And a grad student. And a few other things. I am NOT an old Italian grandmother, or a professional chef, or the type of person who can spend hours carefully crafting a perfect tomato sauce. The last thing I spent hours on was… well, probably Pinterest. Whoops. The point is, if I want a clean Italian meal, it has to be fast and easy. This sauce meets that criteria! Pair it with your pre-made Turkey-Veggie Meatballs and you can have dinner on the table in under 30 minutes easily. In fact, I really just call this Ten Minute Tomato Sauce for alliteration – it takes even less time to throw the ingredients together, or you can let it simmer for however long you have! To keep this sauce simple, I rely on a few convenience items. For those of you who are super strict clean-eaters, you may not like these additions – and, if you have the time to make your own ingredients from scratch, then by all means go ahead! But if you, like me, find yourself frantically staring at an empty stove around 5:30 every night, use the convenience items where appropriate. The ingredients here, though store-bought and obviously more processed, are still relatively clean options without lots of added ingredients or preservatives (there will be some in just about any store-bought item, but you can keep them to a minimum). And they cut prep time down from all day to just a few minutes. 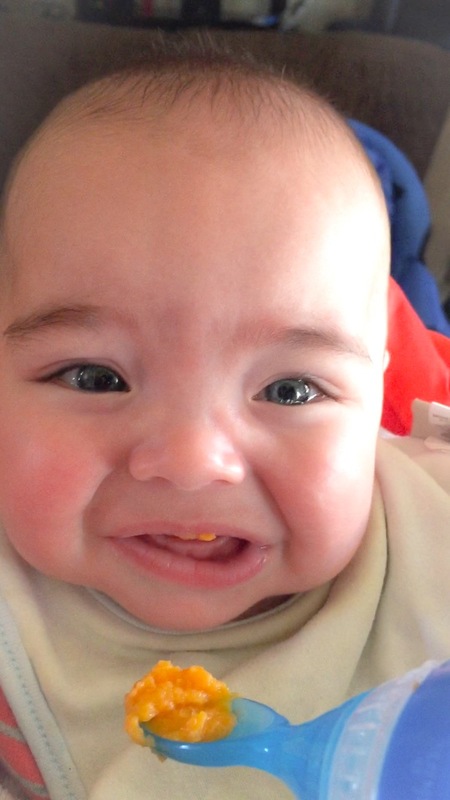 But, when possible, choose “no salt” or “low-sodium” options! As you’ve probably realized by now, I don’t like chopping things. So I do a rough chop, and then use my immersion blender to do the rest of the work for me (the immersion blender is a kitchen must-have for me!). 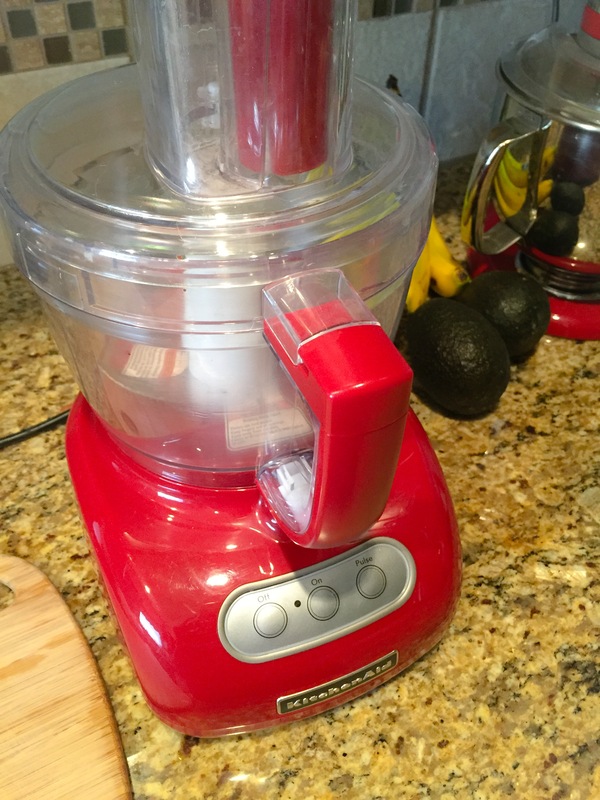 If you don’t have an immersion blender – BUY ONE! Seriously. And, while you’re waiting for it to ship, just chop the onion, celery and garlic more finely by hand. This is a fairly bright sauce, because I like the acidity of the tomatoes. If you’d prefer a more mellow sauce, use a heavier hand with the onion, celery and beef stock (the additional veggies will balance the additional liquid once blended, so you should have a similarly thick finished product). We love this sauce with the Turkey-Veggie meatballs. Once you have everything puréed, you can toss them into the sauce straight from the freezer to heat! You could also add plain ground turkey or even white beans for an alternative protein boost (just make sure both are thoroughly cooked before adding to sauce). Serve with whole grain pasta, zuchinni noodles, or a mix of both! This sauce comes out thick, rich and delicious – no one will ever know that you didn’t spend all day slaving over it! Sweat the chopped onion and celery in olive oil for a few minutes, or until they begin to soften. Crush garlic cloves with side of knife, and add to pot. 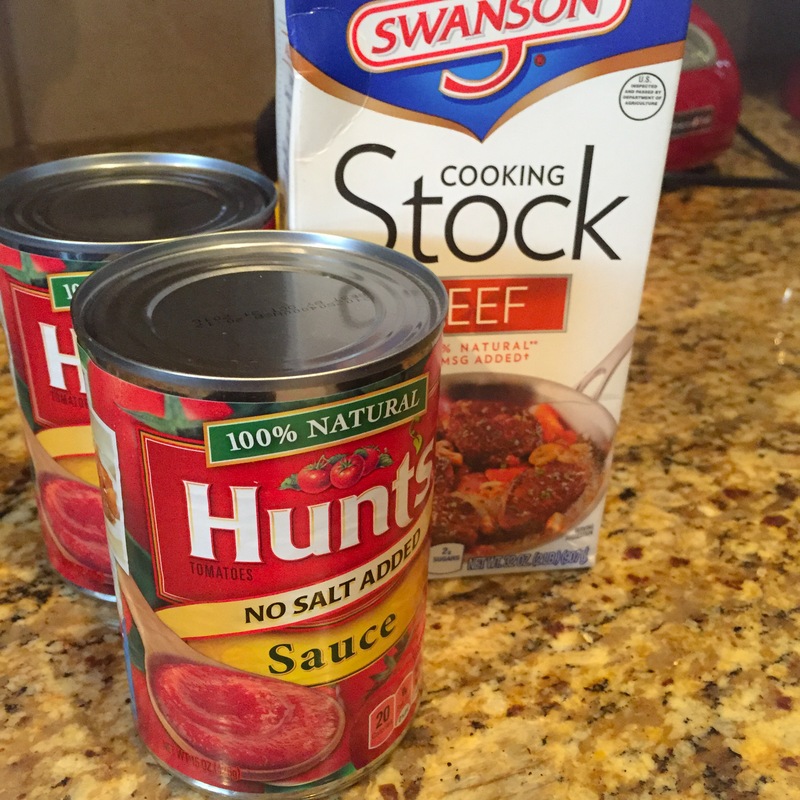 Add in tomato sauce, tomato paste, beef stock, Italian seasoning, and honey, and stir ingredients well to combine. Bring to a boil, then lower heat and simmer for 5-10 minutes (or longer, if you have the time). Then purée with immersion blender until vegetables and garlic are well chopped. If adding meatballs or additional protein, add to puréed sauce, heat thoroughly and then serve. What’s your must-have kitchen item? I’ve spent most of my life in Texas, where approximately 300 days of the year it is too hot to want to cook. We definitely do our share of grilling around here, but sometimes a cool, refreshing salad seems more appealing than anything else. However, my problem with salad is that it’s a little like eating air – I can finish it and still feel like I’ve eaten nothing. So there’s no way I can make a meal out of it without adding a LOT of protein! Tonight was definitely a salad night, because I was short on time and it’s getting quite warm and sunny. 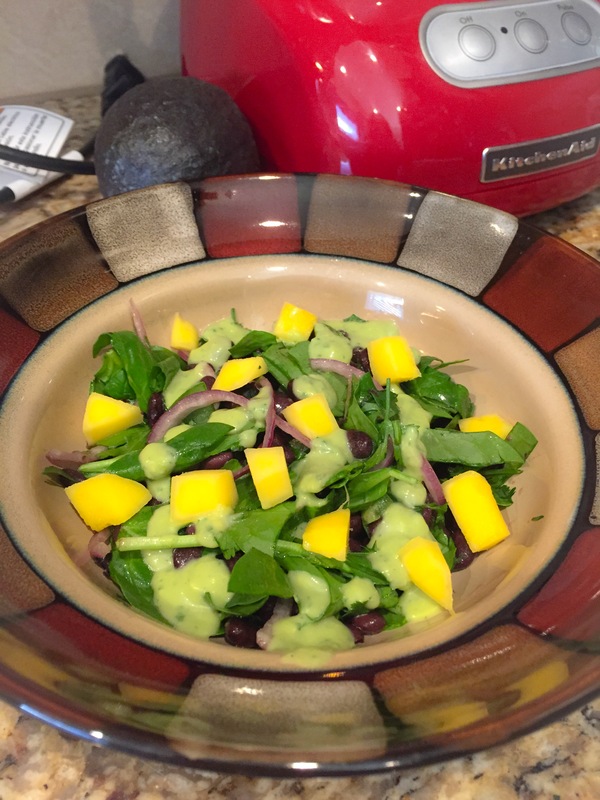 I also found a nice bunch of fresh cilantro and a pretty mango at the store, and had a half avocado I needed to use up – so I based my meal around those three items. My resulting creation got two thumbs up from both me and my carnivorous hubby, which makes it a huge success in my book! 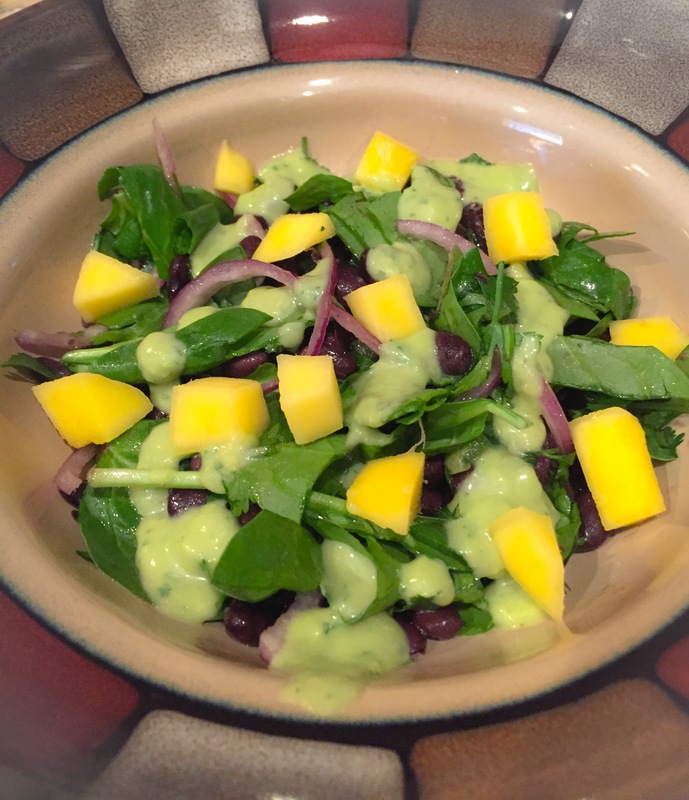 This salad is perfect for a meal, because it’s a great balance of protein and veggies, blending hearty black beans and fresh baby spinach with bright fruit juices and cilantro. Topped with a cool, creamy avocado-based dressing, you’re getting a super dose of vitamins, fiber and healthy fats. I strongly recommend mixing up the black beans and letting them marinate while you prep the rest of the salad! The longer than can sit, the better the flavors with meld and intensify. The jalapeño is definitely optional in here. There’s plenty of flavor without it, but I like the extra kick! Just be sure you taste your jalapeño and adjust the amount depending on the heat level. And even though this salad already has plenty of protein, if you have a house full of carnivores, feel free to top this salad with the meat of your choice – or grilled fish would be especially delicious! 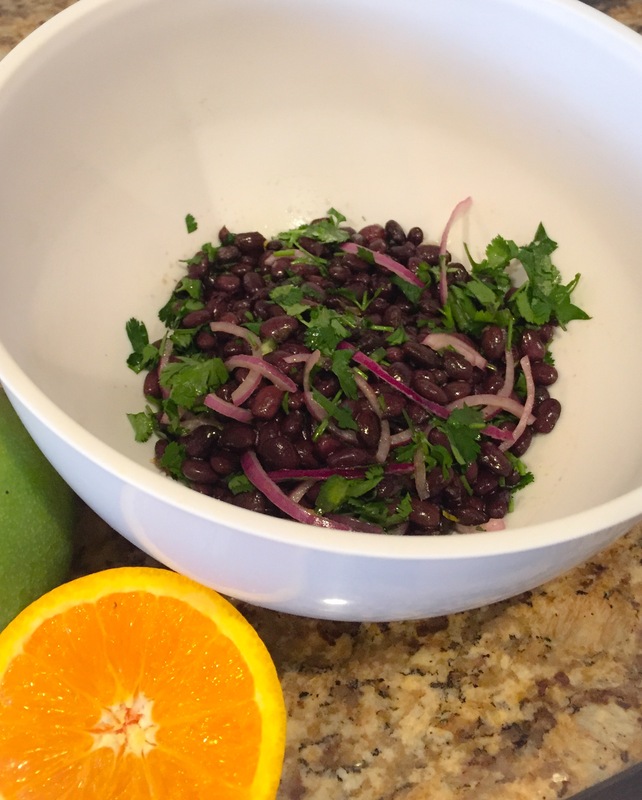 Mix black beans, olive oil, orange juice and zest, red onion, and cilantro (and jalapeño, if you’re using it!) and set aside to marinate. Combine dressing ingredients in a blender or food processor, and blend until smooth – add milk until you reach the desired consistency. To serve, combine divide spinach among 4 bowls. Top with black bean mixture, then drizzle with dressing and sprinkle mango on top. Add a light sprinkle of salt and pepper, if desired. *Black beans are one of my favorite meal prep items. I like to make mine in the slow cooker, then divide into one cup servings and freeze. Confession time: I don’t really like ground turkey very much. Most of my experiences with it have been dry, bland, and I find it very disappointing as a substitute for ground beef in things like chili or spaghetti sauce. But, in terms of a protein option, it’s lean, relatively inexpensive and very versatile – so I’m working on turkey recipes that will change my mind about it. This one was a definite success! 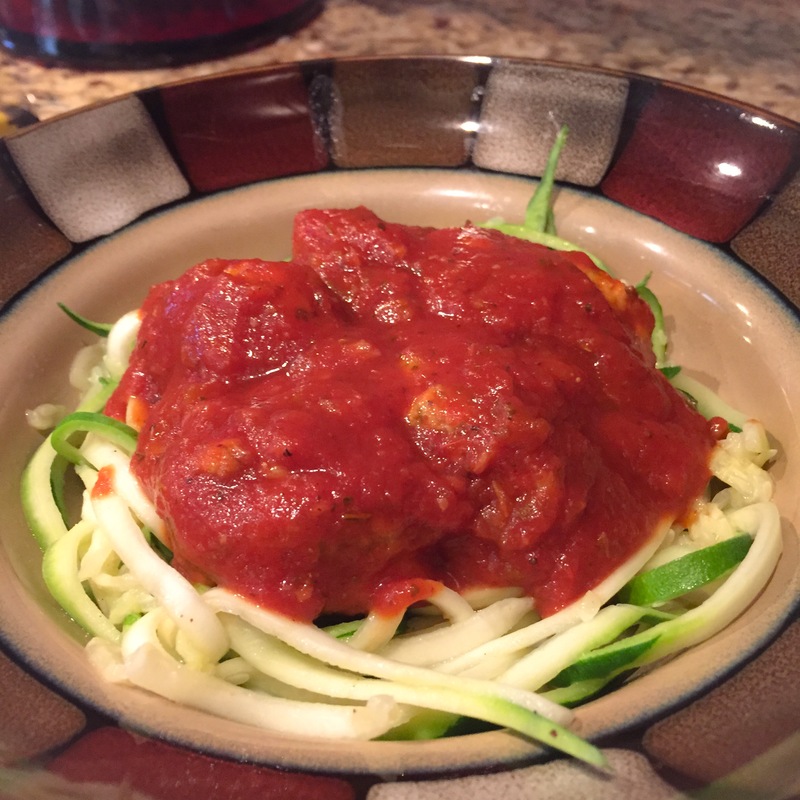 Not only do the vegetables significantly improve the nutritional value of these quick and easy meatballs, but they also lend moisture and flavor to the otherwise bland poultry. 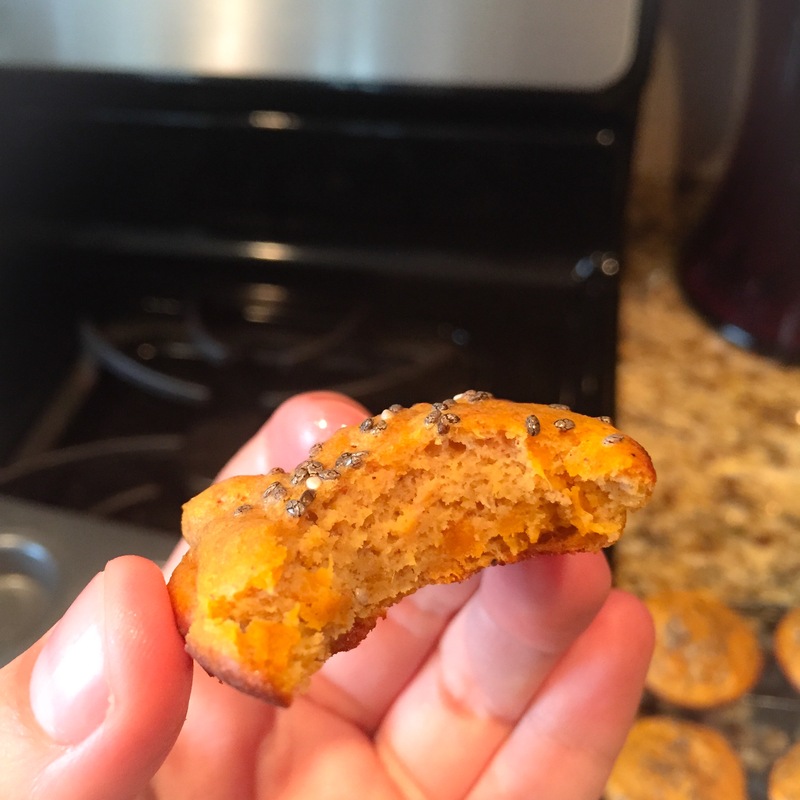 Instead of a traditional filler, I added flaxseed meal to bump up the fiber and omega-3 values, and I like the little bit of nuttiness it adds. Flaxseed meal is relatively easy to find, but if you don’t have it or don’t want to spend the money on it, then feel free to sub ground oats or whole wheat breadcrumbs! 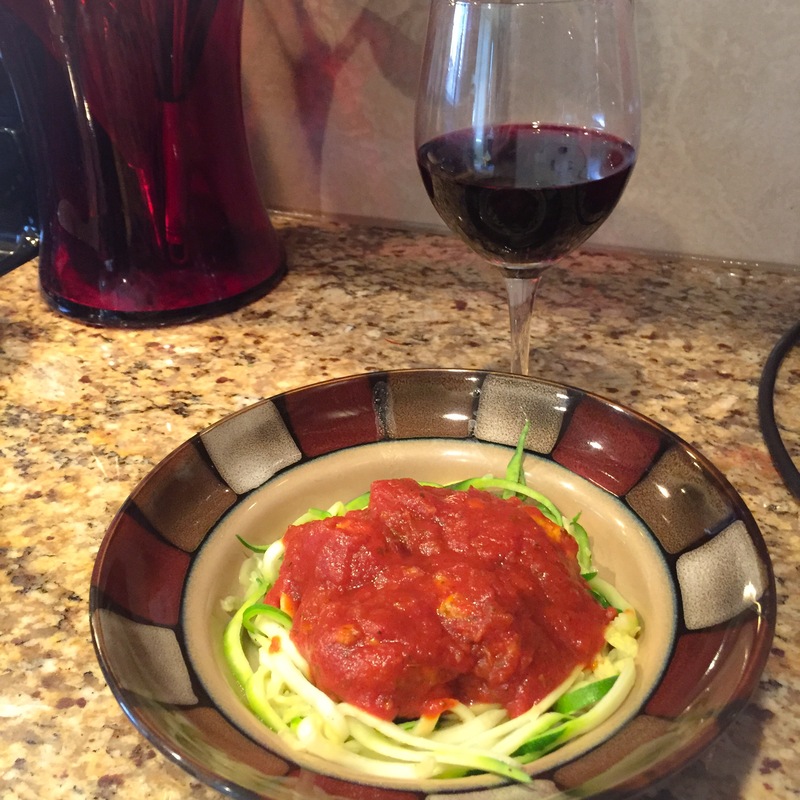 You can add up to a 1/2 cup of filler if you want sturdier meatball. Another bonus with this recipe is that the measurements here do NOT have to be exact! I gave you approximate measurement sizes, but if you have a little less/more of something, they will still turn out great. 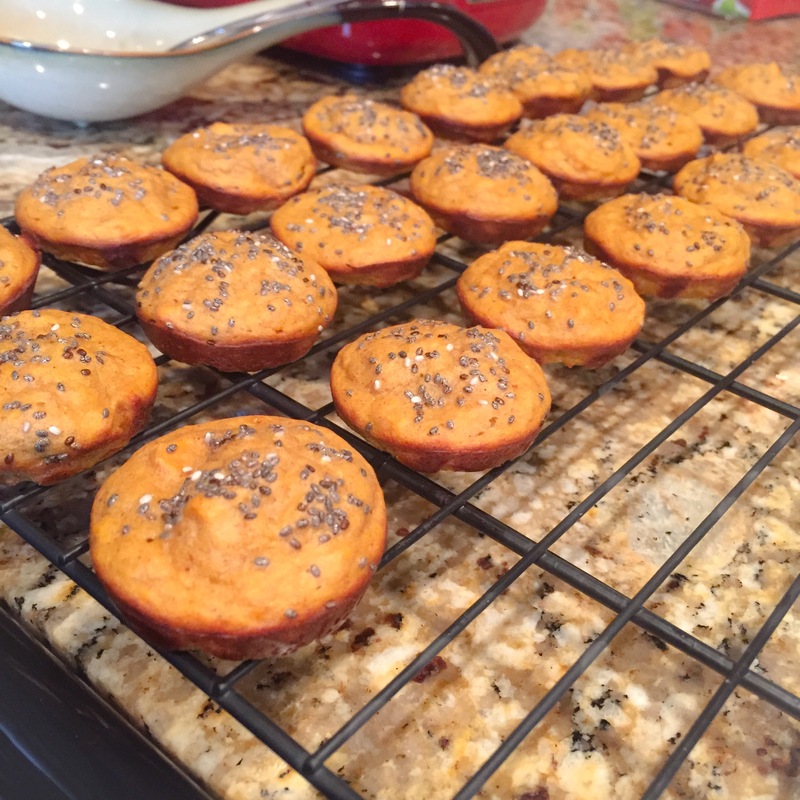 I’m obsessed with my food processor, so it was an easy choice when it came to making these. I just roughly chop all my veggies (I had baby carrots today, so no need to chop those!) and give them a whirl until they are finely ground. I prefer to mix the veggie mixture and meat by hand, however, because I don’t like the texture if the meat is “extra” ground in the food processor. If you want to toss it in there and just mix everything in the food processor, it won’t hurt, but your final product will turn out differently. Now these are not the most beautiful meatballs, so if you’re planning to enter some sort of food photography competition, choose a cake or something instead. Without much filler, they don’t roll smoothly and will flatten some in the oven, and the addition of the spinach turns them slightly green. However, if you’re looking for an easy, versatile staple that you can prep quickly and then keep in your freezer for later meals, they will do the trick. Plus, once doused in a yummy, rich tomato sauce, you can’t even tell what they look like! Preheat the oven to 375 degrees. Line a cookie sheet with parchment paper, or grease lightly with cooking spray or olive oil. Throw vegetables into the food processor, and process until finely ground (if you are using oats for filler, process them as well until they are a similar size). In a large bowl, mix all remaining ingredients using your hands – dig in and get everything well incorporated into the meat! 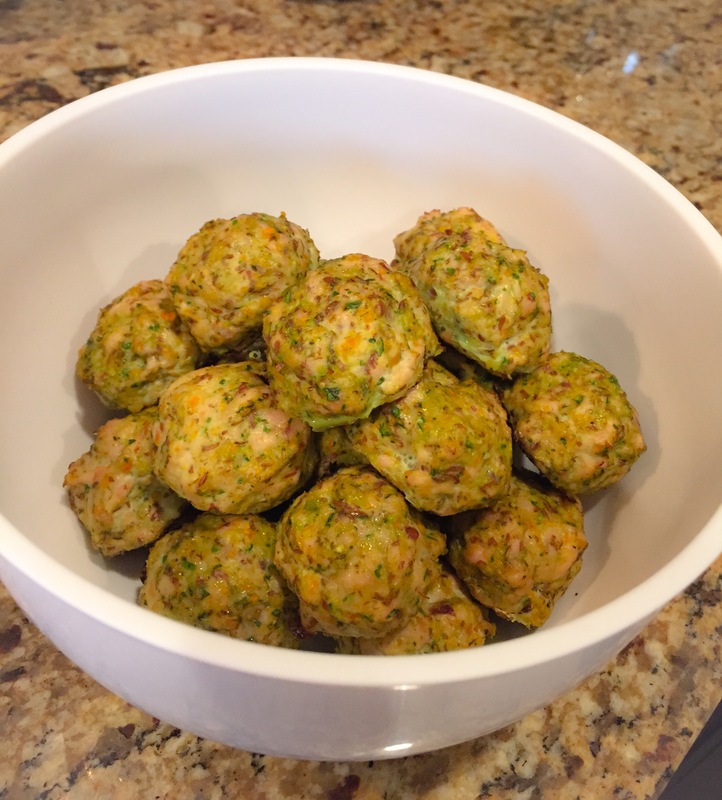 Scoop out the meat into generous 2 tablespoon portions, and roll into balls. 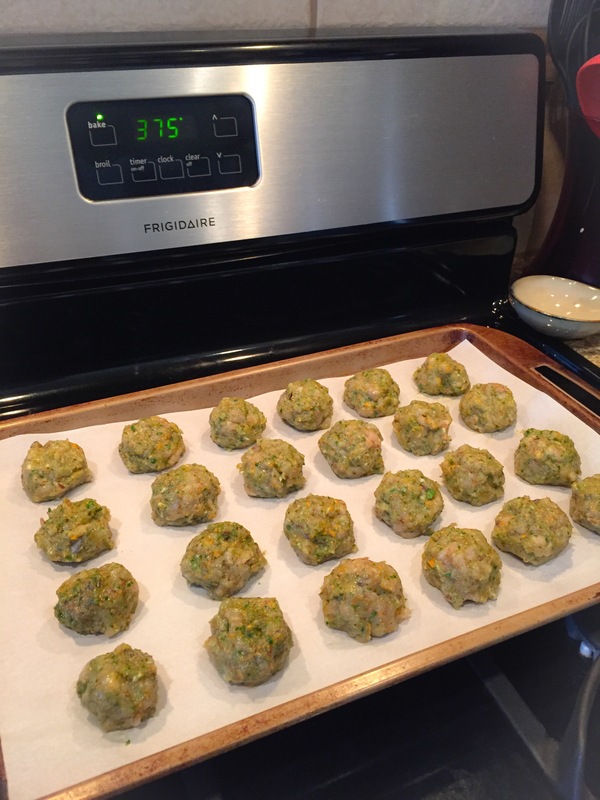 Bake at 375 for approximately 30 minutes, or until internal temperature of meatballs reaches at least 165 degrees. Use immediately out of the oven, or cool and then place in a plastic bag, label and store in the freezer until needed. Cooling and ready to freeze! What are your feelings on ground turkey – delicious, or disgusting? I always have a hard time coming up with lunch ideas. 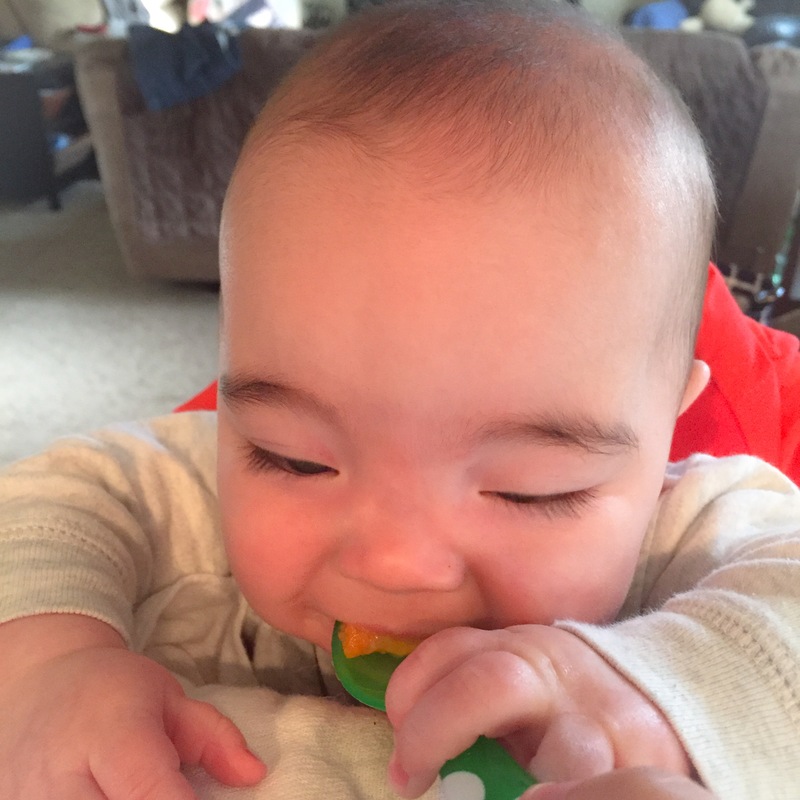 Really, as a meal, it’s pretty inconveniently timed – right in the middle of work, school, and baby naps and feedings. Usually what happens is that I end up not having time to stop and even think about lunch until about 1 pm, by which point I’m starving and will eat just about anything and everything I can find. Meal prep has helped me so much with getting healthier lunches faster. 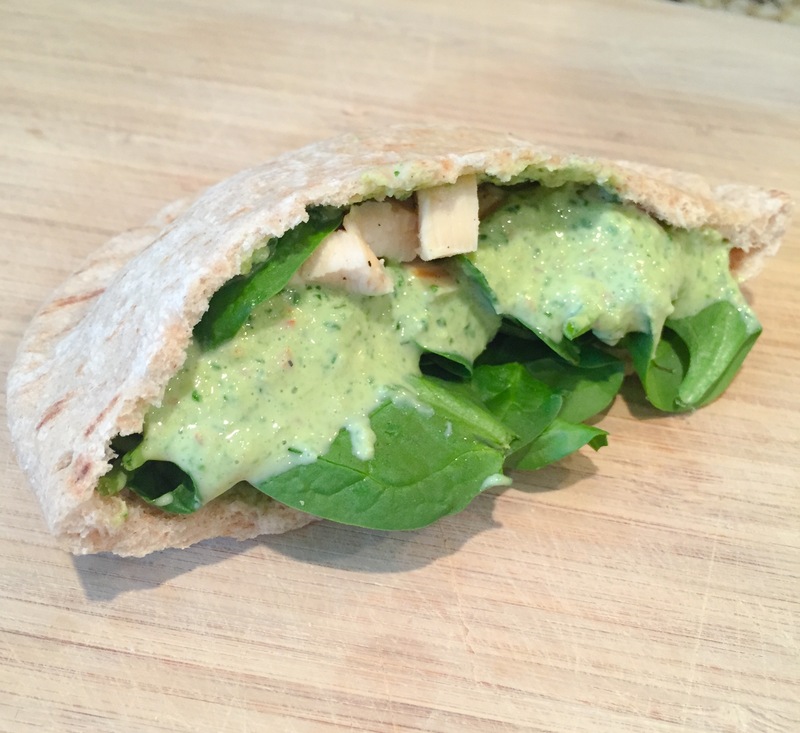 I love easy grab and go items like pitas, or quick salads which can be put together in minutes if veggies are pre-washed and chopped. However, both of those items can get a bit bland and boring without some sort of spread to liven them up. The problem with most veggie spread recipes out there is that they call for cream cheese, which is delicious, but not the most nutritious. 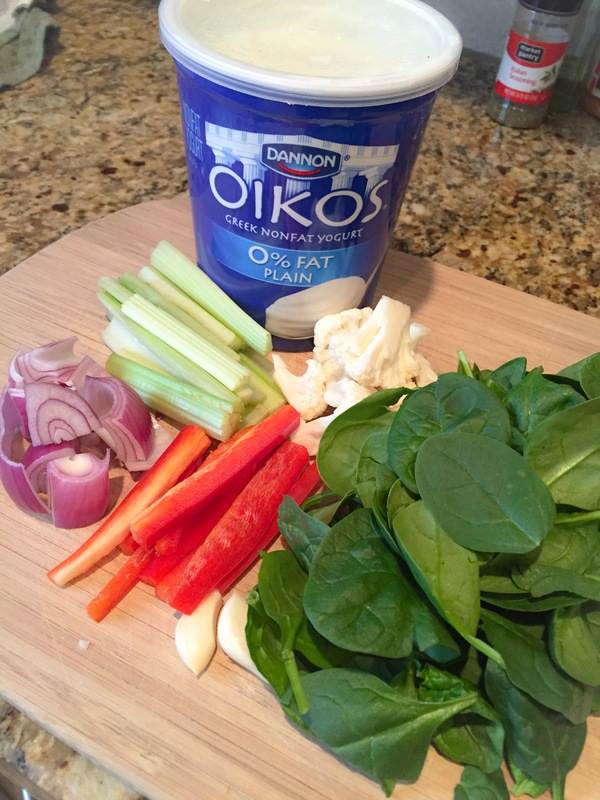 I much prefer to sub protein-rich greek yogurt, but those recipes tend to rely on pre-mixed dressing packages which often contain ingredients that are neither clean nor pronounceable. Is this really what you want to put in your body when you could eat REAL food instead? This spread goes together quickly with a food processor, and you can store it in the fridge to use throughout the week. It is loaded with vegetables, and is perfect for spreading on sandwiches, topping grilled chicken or fish, or drizzling over salad (thin it out with milk if you want a more traditional salad dressing consistency). You can also customize it with any vegetables or seasonings you like – these are some of my favorite suggestions, but I often vary it with whatever is in the fridge! 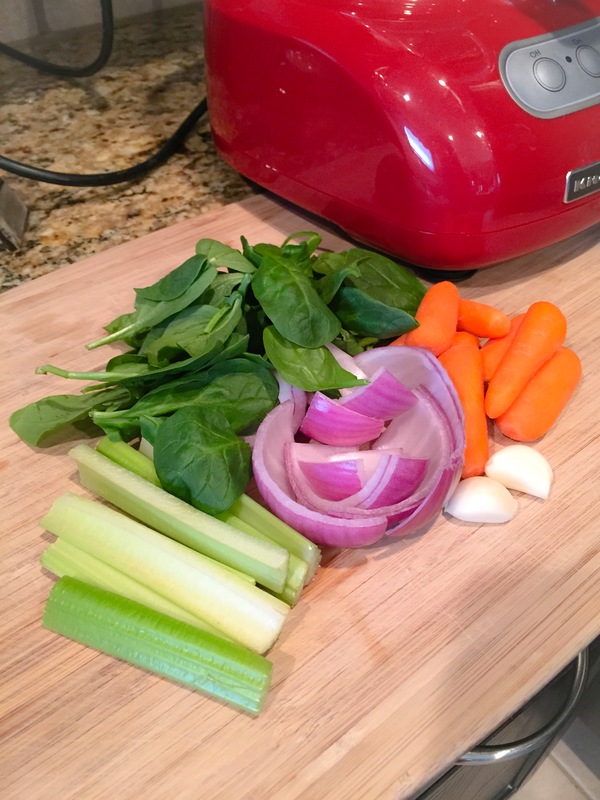 Roughly chop large vegetables and add to food processor, along with spinach and garlic. Process until finely ground, then add greek yogurt and spices. Process until well mixed (or stir by hand). Feel free to adjust measurements on ingredients if you would like your spread to be thicker/thinner. 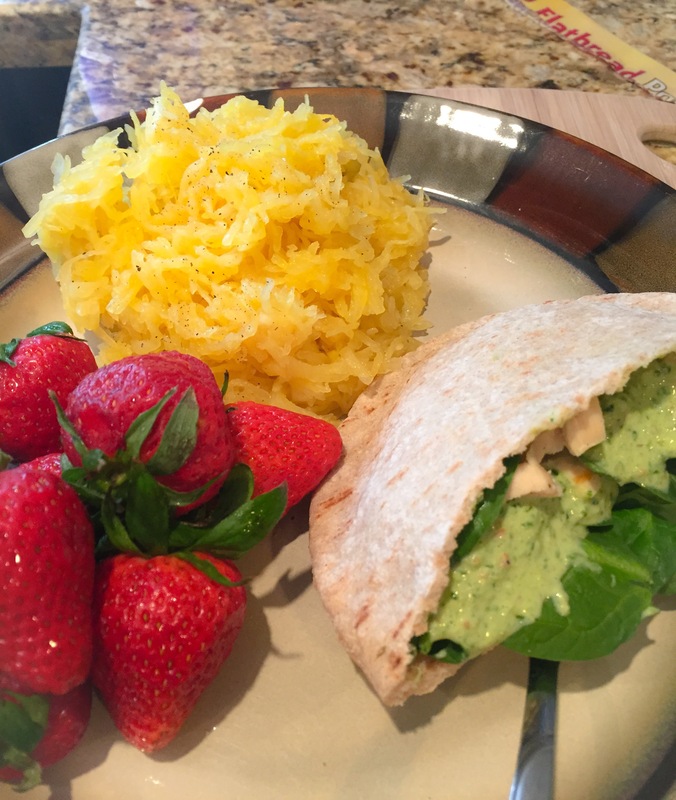 Today, I was able to put together lunch in less than five minutes by smearing this veggie spread inside a whole-wheat pita pocket, adding additional spinach and chopped chicken that I grilled last night, and then reheating leftover spaghetti squash on the side! Hubby and I also picked up some great strawberries yesterday, so I put those on my plate as well (I shared with him – not all those are mine!). Do you have a go-to lunch recipe? 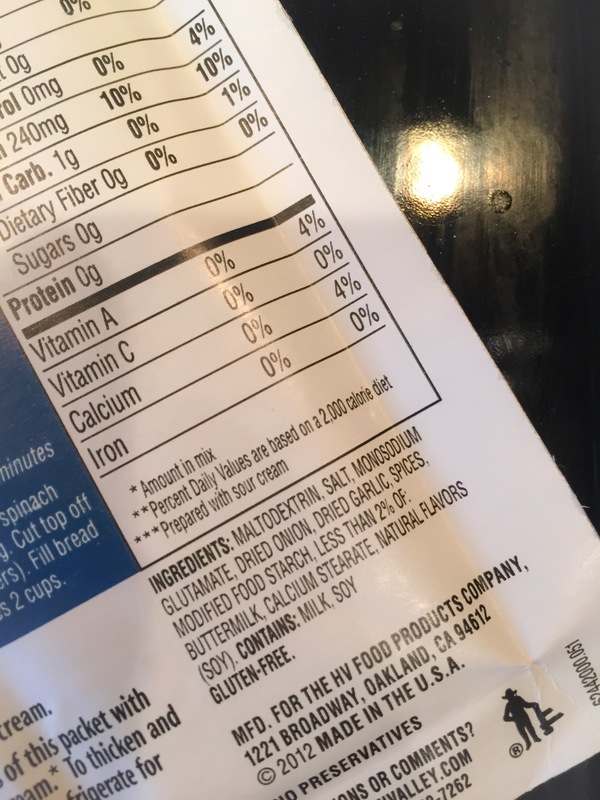 What do the above ingredients have in common? A quick, delicious dinner – of course! It’s getting warmer here, which always gives me the urge to grill. Our grill has seen better days, so I am dreaming of the day we can replace it, but for now I’m making the best with what I’ve got! Today I needed a quick dinner idea that met my clean eating challenge requirements, so I decided to take some chicken from the fridge and combine it with the multitude of oranges I have rolling around in the crisper drawer. 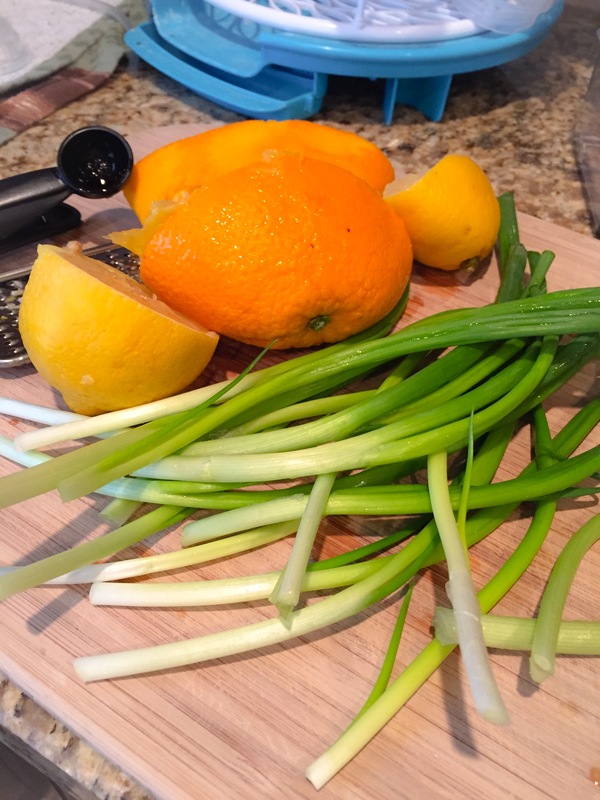 I found a citrus marinade recipe online, but decided to make a few adjustments – both for taste, and because I didn’t have the right ingredients! The result was fantastic! The acid from the citrus kept the chicken tender and juicy, while the natural sugars from the fruit provided the perfect amount of caramelization on the grill. Of course, if you don’t have a grill, you can certainly cook your chicken in the oven – but you may not get the same caramel effect. Pounding out the chicken is also an important step that will help speed up cooking and give you more reliable results. Plus it’s a great way to relieve any unrelinquished anger you might have! 🙂 And Rachael Ray has a great tip for freezing fresh ginger so that it doesn’t go to waste that is very useful here. 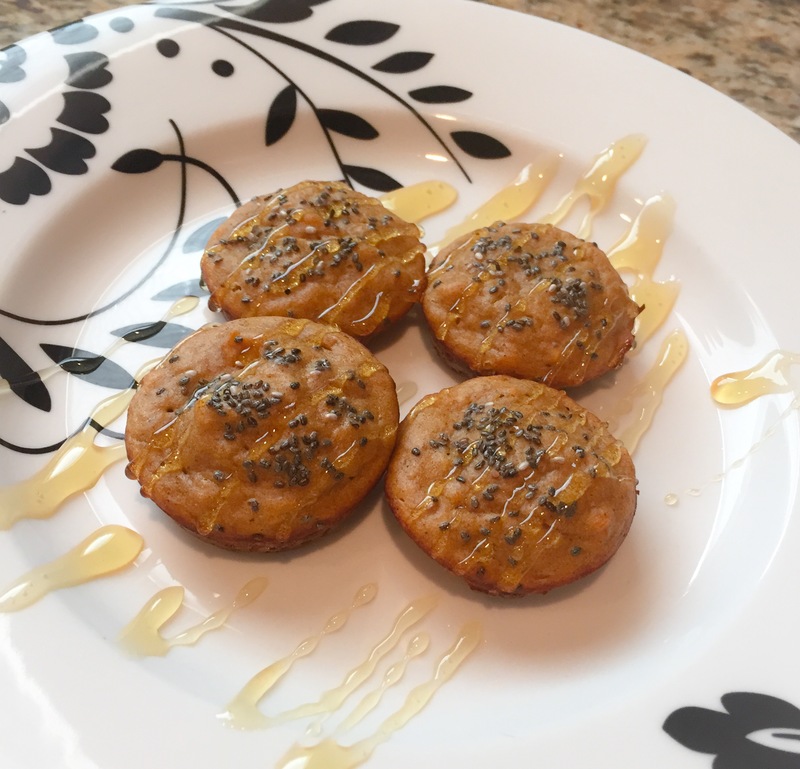 The coconut oil in the recipe is also optional – I’ve found that I have better outcomes with chicken if I add a little fat, and the mild coconut flavor blends nicely with the bright citrus. 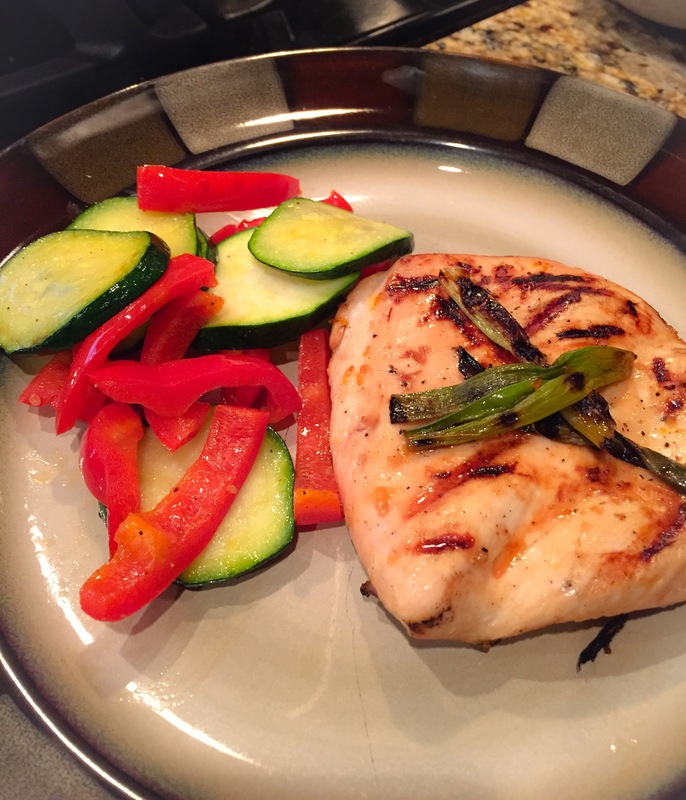 We paired our chicken with a simple saute of zuchinni and red bell pepper, which would have been equally good on the grill except that I decided to also grill some plain chicken for meal prep and ran out of room! This recipe is easily doubled or tripled if you need to feed a crowd, and can be frozen if you’re trying to do meal prep ahead of time – just don’t add in the green onions until everything is thawed. A quick note: I know some clean eaters try to stay away from soy sauce. We are definitely still a soy sauce family, so I didn’t hesitate to put it in this recipe. However, if you would prefer to use coconut aminos to substitute, feel free. But you may want to add a little extra lemon juice to balance out the sweetness, and add additional salt. Mix juices, zest, soy sauce, ginger and coconut oil in a bowl or gallon bag. 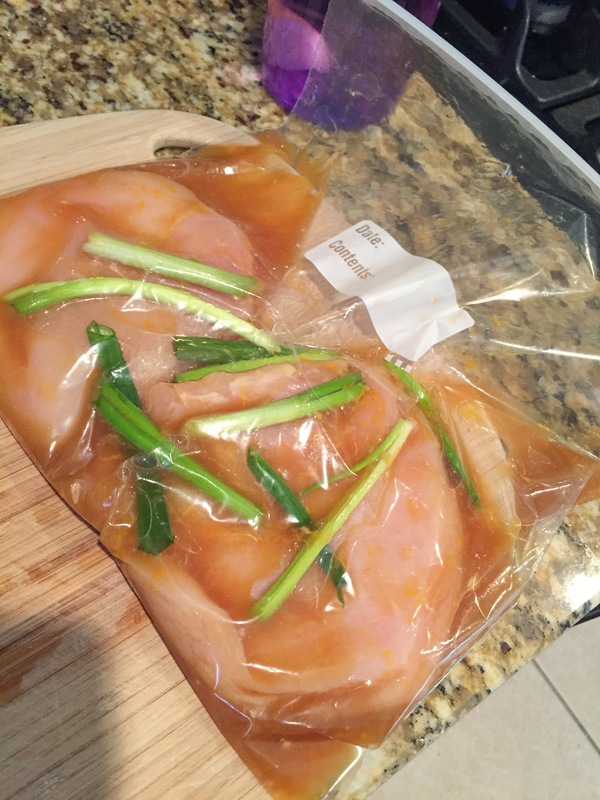 Pound chicken breasts to an even thickness, and then add to marinade along with green onions. Allow to marinate for at least 30 minutes, or up to overnight. When ready to cook, preheat grill to medium-high heat and then cook chicken until it reaches an internal temperature of 165 degrees (cooking times will vary based on your grill temperature and the thickness of your chicken). Within the last few minutes of cooking, add green onions to grill and char, then serve over finished chicken breasts. When it came to breakfast, the majority of my traditional favorites were not clean – I love fluffy waffles, anything with bacon, and rich, creamy french toast. Thus, one of the most difficult parts of my wellness journey has been trying to come up with cleaner breakfast options. 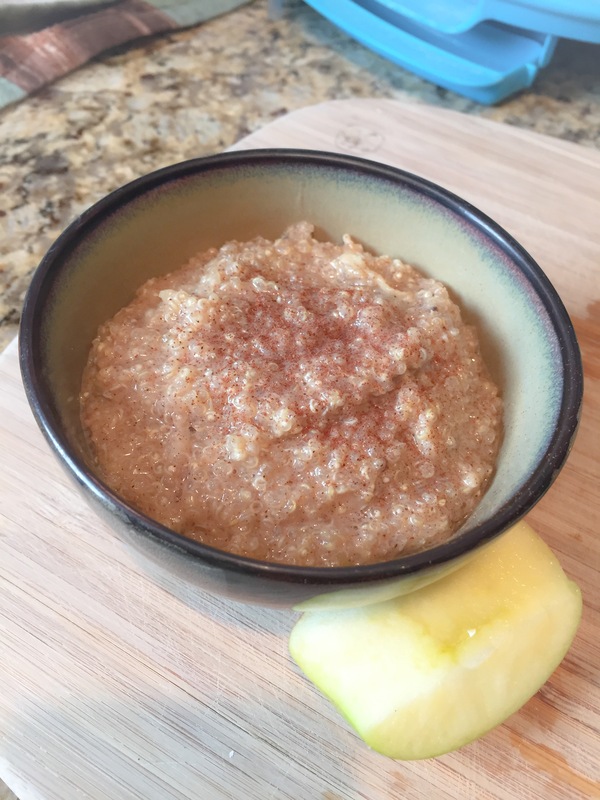 Oatmeal is an easy go-to for clean eaters, and a great, nutritious option, but it also gets kind of boring after awhile. So I started considering other grains I could use instead for a sweet, filling breakfast. Quinoa is one of my favorite grains for lunch and dinners, so I thought: why not breakfast? I love this recipe because it is sweet, creamy, and full of protein (and other nutrients) from the quinoa. Cook the quinoa per package directions. Once all water has been absorbed, stir in milk and continue cooking over low heat (the quinoa will continue to absorb some of the liquid as you mix in other ingredients). Add in honey, cinnamon, and grated apple, and simmer for an additional 5 minutes to meld flavors. Serve with an extra drizzle of honey, or sprinkle of cinnamon on top!